Doug led twenty-six cyclists for this week’s ride. The destination for coffee was the Fyansford Paper Mill, which is now a burgeoning arts and crafts precinct, complete with whimsical cafe – The Door Gallery Cafe & Wine Bar. Before coffee, Doug had planned a visit to view Buckley Falls and the Mill environs from above Fyansford. Most of the group opted to do this. Doug had also printed out information about the Paper Mill’s history for our cyclists’ perusal, and asked the owner of the Mill and surrounds, Alex, to give the group a short talk about the Mill history and his plans for its future. (Did you know that The Fyansford Mill had one of the earliest hydro-electric plants in the world?) The Doors Gallery has multiple decoratively carved antique Indian doors, as both decor and for sale. 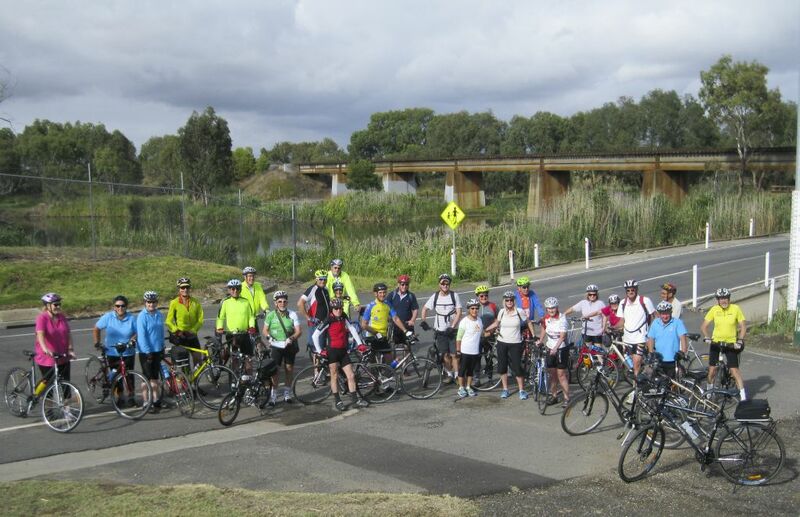 The cafe provides a good alternative to our usual stopping place, though, as yet, there is probably not enough space to accommodate Cycling Geelong’s summer river riders. The group was joined at the mill by Stephanie and Geoff and Nancy, with her daughter Meredith and granddaughter, who, quite naturally, was the focus of attention. Thanks Doug for leading an enjoyable and informative river circuit. David Fisher is next week’s leader.